When will I get my ACT scores? If you have an online account with the ACT website, you can view your scores about two weeks after you take your test. If you are waiting for your scores to be sent in the mail, it can take anywhere from 3 to 8 weeks. What is the highest possible score on the ACT? What is the average score? The four main sections of the ACT are scored on a scale between 1 and 36. These scores are then averaged to a number which becomes your composite score. The highest possible score possible on the ACT is a 36. The average score on the ACT is a 21. Be sure to check with specific institutions and programs of study to see what the ACT requirements are. The official website has a useful sample score report you may want to take a look at. How is the optional Writing test graded? For the optional writing exam, your essay will be graded by two certified readers, who will each give you a score between 0 and 6. These scores will be added together to give you a Writing score between 0 and 12. 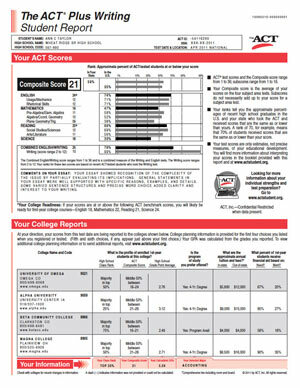 The ACT Writing score does not affect your ACT composite score. However, you will receive a combined English and Writing score. Your writing exam will be scored based on organization, clarity, sentence structure, word choice, grammar mechanics and usage, and how well the question is presented and answered. How do I make sure my scores are sent to the institutions of my choice? You can request that copies of your scores be sent to as many institutions as you like. You’ll need to find the codes for the colleges and universities in which you are interested, which you can do here. The first four scores are sent at no cost, but each additional copy costs $10 (the exception is if you order a priority report via telephone, which costs an additional $13). You may request and pay for these orders online, through the mail, or over the phone.